A unique aircraft with a distinctive design and innovative engine technology – that is how one could sum up the features of the Hy4, which the German Aerospace Center (DLR) had already showcased at the World of Energy Solutions on Oct. 12, 2015. The new concept study was presented by project head Professor Josef Kallo, who had already been responsible for developing its predecessor. This time, he collaborated with the project partners to design a four-seater run by fuel cells and accommodating up to three passengers. The Hy4 is the next logical step in the evolution of the hydrogen aircraft based on its predecessors: The model that started it all was called HyFly3000, which had been envisioned around ten years ago by Frieder Herb from the ExtraEnergy association and Lange Aviation, but was never constructed (see HZwei magazine from April 2006). A project based on this first model was only implemented after the DLR took over at the helm and showcased the Antares DLR-H2. 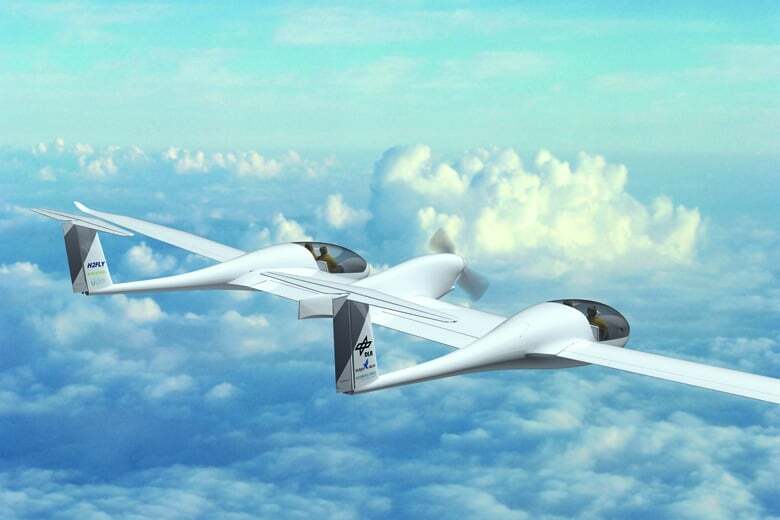 The prototype of this power glider was presented in Stuttgart in September 2008 and took off from Hamburg in July 2009. It was considered to be the first pilot-controlled aircraft with a fuel-cell engine. Shortly thereafter, the Antares-H3 project was launched in August 2010. Initially, it was said that this successor model was to “set new standards in flight duration and range.” There was even mention of a transatlantic trip and the use of the model for unmanned aerial surveillance. The first flight had already been scheduled for 2011, but never happened. Now in his position as DLR Coordinator Electric Aviation, Kallo is making another attempt at realizing the dream of eco-friendly flying. This time, however, he partially relies on a new team. After many years, Kallo parted ways with Axel Lange, who had great influence on the development of the previous versions, but the ideas of both technicians seemed to have been too far apart to be reconciled. Instead of the Antares base version used so far, the new team will now employ a Pipistrel Taurus G4. This model by the Slovenian manufacturer with the same name, which up to now had been merely used for technology testing as well as during competitions, consists of two Pipistrel Taurus Electro G2 and was awarded the Green Flight Challenge of the CAFÉ Foundation in September 2011. According to a DLR statement, the aircraft’s unusual twin fuselage design should enable an optimal distribution of engine components and allow for a higher load in general. The base model, which will incorporate the fuel-cell and H2 components, is already in the hangar. The engine of the trendsetting flight objects is said to consist of a low-temperature fuel cell (45 kW) from Hydrogenics, as Kallo considers this fuel-cell type to be more efficient and powerful than systems used previously, which mainly focused on a long lifespan. As a backup, the aircraft is said to contain a high-efficiency lithium battery (21 kWh) for peak loads. Both units together will supply the 80-kW electrical engine, which can accelerate the Hy4 to a maximum speed of 200 kilometers per hour (travel speed: 145 km/h). The gaseous hydrogen stored in the pressure container should make for a range of 750 km. There are plans, however, to switch to liquid hydrogen, which would enable the aircraft to travel greater distances (around 1,500 km). 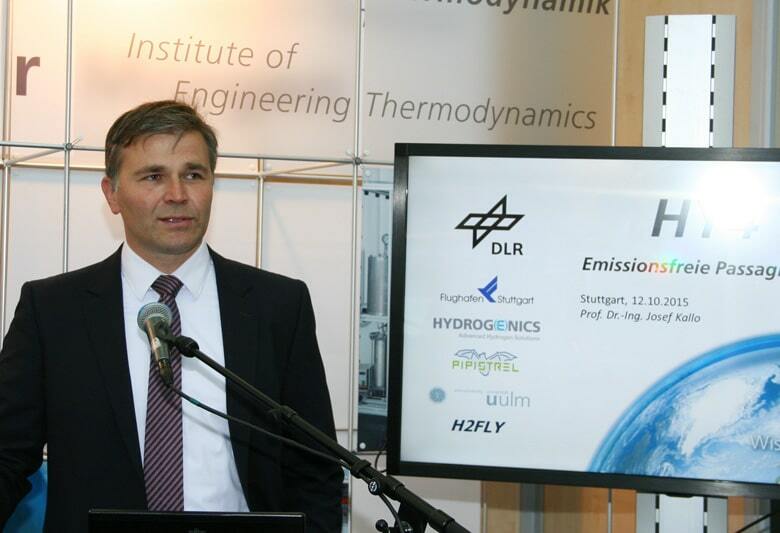 To implement this newest project, H2Fly was established, a spin-off of the German Aerospace Center, which as the operator of the Hy4 will take care of realizing and approving the aircraft, as well as making sure that research (DLR, Ulm University) and technology (Pipistrel, Hydrogenics) work hand in hand. The Stuttgart airport is also onboard – it had already supported the project with EUR 180,000 when it was launched. The funding did not only ensure that the program got off to a good start, but it also underlined how Stuttgart was “the most ecologically sustainable airport,” as the head of the airport, Professor Georg Fundel, put it. Further financing of the project has not been secured yet, although Kallo was confident that this would be done in time. As aviation visionary, Kallo sees the potential of transporting more than four people (pilot and three passengers) this way in the future. He believes that a 40-seater could be realized from 2020 onward. But right now, plans are to have an initial trip in the summer of 2016, which could be followed by the first long-distance flights in 2017 and 2018. When will the HY4 be available yo buy, and what will it cost? No chance to buy it. This is a demonstration project which will take three years. It is totally unsure if there will be a commercial products afterwards.